Posted on January 2, 2018 . 7 Comments. 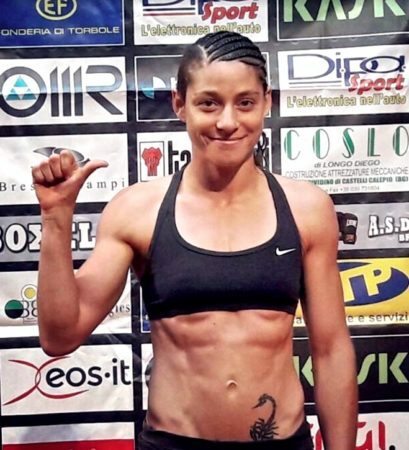 My name is Ilaria Scopece, and I am the “skinny boxer.” It has not always been this way. I was a gymnast before I put on boxing gloves. For eighteen years, I practiced artistic and acrobatic gymnastics, successfully competing in national and international events. My bigger dream was to bring my acrobatic gymnastics to the Olympic level. Since I was a child, my vision regarding gymnastics was clear: training, competing, studying, training, and building my own team. I enrolled in sports science in college, to lay the first brick toward the dream I was building. But after I earned my bachelor’s degree, I discovered my goal was not such a simple thing. Due to some internal issues in my company, I was forced to quit gymnastics and train my current teammates. For a while, this worked for me. After all, the gym was my home and my teammates a family extension, but my disappointment at the cessation of my own training turned my outlet into a prison. I decided I needed a new way to continue physical activity, not only to maintain a decent state of shape, but also to relieve my stress and find a new sport—one without age limits. So, I went to a boxing gym. Learning new techniques and different training methods, being flooded with adrenaline, and facing confrontation with myself and others—and all this on a daily basis—allowed me to fill the void left by gymnastics. When the coach proposed I fight in a match, I knew I wasn’t ready to hang up my athletic shoes. It’s just that my dream had changed, and this was the beginning of a new adventure. From amateur, I progressed to the Elite I division, and became a national team athlete in the Italian Boxing Federation. I fought 43 matches, for a record of 28 wins, 3 draws, and 12 losses. I won several regional titles in 2010 (51kg weight class), 2011 (51kg weight class), 2012 (48kg weight class) and 2013 (48kg weight class); two Golden Gloves in 2013 (51kg weight class) and 2014 (48kg weight class); and a silver medal in the Absolute Italian Championships in 2013 (48kg weight class). 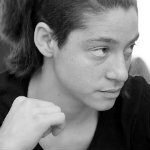 I also fought with the national team, earning bronze at the Triangle Italy-France-Romania 48kg (2013) and participating in a dual match, Italy versus Sweden (2014). Now, I am a professional boxer fighting in the light flyweight weight class. I have fought five matches and won two by knockout. I am currently third in the European ranking and 43rd in the world ranking. In December of 2015, I attended Fabio Zonin’s preparatory workshop. In June of that same year, I earned my SFG Level I Certification. Two weeks later, I made my debut in the world of professional boxing. At the time, I was looking for different training methods to integrate new and fun training stimuli. I have always used myself as a guinea pig for different types of training, both to gain experience and to verify the effectiveness of the plans. In StrongFirst, I found a school, a method, and a lot of friends who shared my passions. Based on these experiences, I wanted to try using kettlebells to prepare for my boxing matches. I knew, though, that I would not get the result hoped for, if I wrote the programming myself. When I was invited to fight for the European boxing title in June of 2017, I asked Fabio for help. Fabio then spoke with Pavel, and Pavel agreed to assist in my training. On January 4, 2017, I began the program. The training plan was comprised of three parts. Pavel and Fabio handled the strength and conditioning with my kettlebell training. Cristian Zedda headed up the sport-specific part, and Alessio Taverniti, head coach of the Testudo Boxing School, oversaw my fight strategy. A professional boxer needs a good aerobic base to be capable of moving, recovering between rounds, and enduring for the duration of the fight—but he or she must also have high lactate tolerance and be able to withstand the onset of fatigue as the rounds add up. 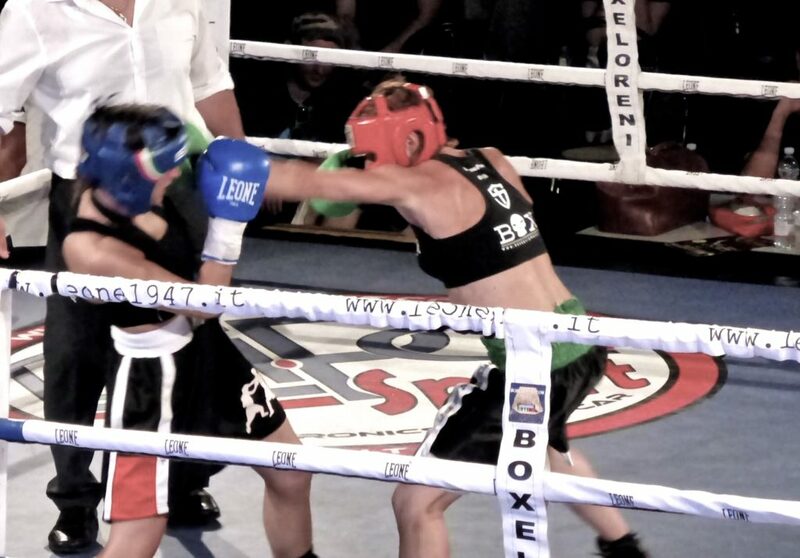 In professional women’s boxing, title fights are ten rounds in length, with each round lasting two minutes and being separated by one minute of recovery. A fighter must be quick, explosive, powerful, and precise for the entirety of the fight. And since final rounds are the most decisive, the boxer must be able to resort to the anaerobic lactic-acid energy system. Cristian’s program involved specific interval training performed on a punching bag or focus mitts. The purpose was to create explosiveness and power in my punches, for every round. 1. Power boxing: The athlete hits a punching bag with maximum power. 2. 10×10 method: The athlete must do a sequence of ten fast, powerful, non-stop punches, and repeat for ten times, with a rest between each set of 100 being less than the match rest will be. 3. Reps in sequence: The athlete must perform a predetermined number of punches (from two to four) for the duration of a round. We did this three times a week. At every session, we established the number of punches to be executed during the round (2, 3, or 4), how much rest between each interval, how many rounds total, and which glove weight to be used. Pavel decided to use Template 033, a Strong Endurance™ protocol, essentially composed of two movements: one-arm swings and pushups. The pushups in this plan are performed explosively and in accordance with the principles taught at the SFB Certification. This movement is similar to the impact of a punch in its starting acceleration and final contraction/tension. 1. One-arm swing max reps in 20-30 seconds for each side, while maintaining perfect technique and explosiveness. 2. Max reps of pushups, performed explosively and technically perfect, in 20-30 seconds. All specifics of this plan are available at the Strong Endurance™ seminar. I started with the 20kg kettlebell and performed the pushups with the assistance of a rubber band anchored to my pelvis in order to perform movements of absolute quality. After three weeks, during the retest, my numbers grew. So we decided to retest again the day after. We increased my kettlebell weight (from 20kg to 24kg) and removed the rubber band. 1: Start test, with 20kg kettlebell and rubber band anchored to pelvis. 2: Re-test, after three weeks. 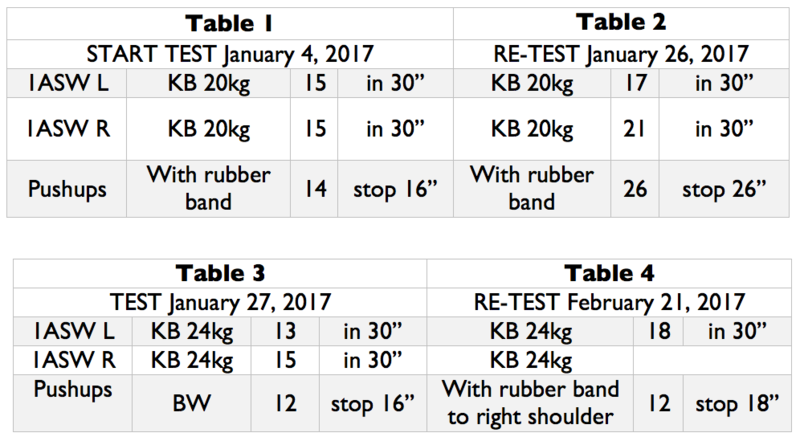 3: New start test, with 24kg kettlebell and without rubber band. 4: Re-test, after six weeks total, with 24kg kettlebell and with rubber band attached to my right shoulder. Unfortunately, as you can see in Table 4, there is no value for one-arm swing with right hand, and you may also notice the reappearance of the rubber band. This is because I broke my right thumb during a sparring session. So rather than not learning the results from my training, I testes only with the left hand and with the rubber band attached to my right shoulder. The numbers do not lie—I experienced an objective improvement. So, yes, I broke my thumb during this preparation program. Everything had been going well, I was experiencing benefits from the training, and I began to see the results of my hard work in both sparring and various test matches. Then—oops—a compound fracture of the base of the thumb at the first metacarpal. The doctors put my right hand in a plaster cast and within a week I had surgery to realign the fracture. Somehow, in the middle of this misfortune, some luck appeared: my match for the European boxing title was cancelled due to the opponent backing out. Despite this—and on the basis of the idea that the one who stops is lost—I did not give up on my training. According to a study by Ikai and Fukunaga 1970, Houston et al. 1983, Komi et al. 1978, if a person continues to train, despite the injury or immobilization of a certain limb, there will be less strength reduction in that injured limb than if a person had not continued to train—even though the person is not actually training the injured/immobilized limb. What better opportunity to try this theory on myself? I continued training as much as possible, and in accordance with the advice of my orthopedic doctor. The intent was to heal as soon as possible—while not losing ground toward my physical and technical goals—and to not overdo it by specializing too much and, therefore, having to take too long to rebalance my body. I did swings with my healthy hand and performed pushups with the rubber band, as that allowed me to not load the injured limb. While I was waiting for the resumption of my sport-specific work, and after I regained my mobility and grip strength, Pavel came up with a brilliant solution for my conditioning training. In order to not compromise the healing process of my fracture, he had me set aside swings and pushups and instead assigned me a kettlebell press and modified barbell Zercher squat program. Perhaps it is more appropriate to call it Zercher deadlift. And, yes, the brilliance resided right there. Pavel had found the way to make me work the motor pattern of the hip hinge, which would allow me to develop strength, but did not involve the thumb, yet still positively influenced the defensive position of the arms that I would need to hold throughout my fight. The new protocol started with a series of tests. In the press test, which was performed according to SFG standards, I would have to find my 6-10RM. In the Zercher deadlift, I would have to find my 5RM. The press program consisted of different ladders, depending on the result obtained in the test. In my case, I performed 9-10 reps with 12kg. I trained three days a week. Within a week of starting the press program, I was able to press a 20kg kettlebell on both right and left, to my great astonishment. Once I obtained approval from my orthopedic doctor and physical therapist, Pavel and Fabio modified the program again by including presses, deadlifts, swings, and pushups. The press continued its path, swings and pushups resumed according to Template 033, and deadlifts proceeded in the Zercher squat mode. Time passed, and I started again with Cristian’s sparring and reps—awaiting the scheduling of my comeback match. At a bodyweight of 50.8kg, I was scheduled to fight against Viktorija Mihailova, a boxer from Riga, Latvia, on October 1, 2017. Therefore, in May, I restarted the 033 protocol established by Pavel and Fabio, along with Cristian’s training. From the start, I could tell my hand had not lost strength and my hip snap had been preserved. In addition, I was using the same loads as before my injury. It was a wonderful discovery. While sparring with my partners, I also realized I had even greater speed and explosiveness and I was able to maintain this for the whole match. On the day of the fight, I was fine, excited, and ready. The bell rang and the match started. From the first moments, I was aware of the speed I had gained in my hands. Soon, I also felt the concreteness of my punches and, after a quick exchange, I struck the winning combo. At 37 seconds into the first round, I won by knockout. Throughout this training, even with the ups and downs, my dream remains the same—to compete in a match for the European title. The road has not been so easy, since the previous scheduling of my title match was cancelled when the holder of the title retreated. To this day, the title remains vacant. According to the regulations, the first two athletes in the EBU Ranking may fight for the title, and currently, I am ranked third. The climb to European title starts again! I wonder if you think boxing or gymnastics is the more demanding sport? I’ve done some boxing but couldn’t imagine doing gymnastics, hehehe. I’m not big into formal competition, but speaking of informal competition and skills, Pavel’s Simple and Sinister programme has done WORLDS for my judo! A very good article. I would like to know what is the 003 template. 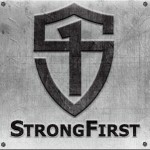 I live in the U. K. and will be attending the Strongfirst Combat in June. Is this the same as Strong Endurance, which the 003 template comes from. Paul, no, that is a very different event. Congratulations, Ilaria – tremendous results! This is an awesome article, thank you Ilaria:). I have three constants in my life that will never be changed: my family, Holly Bible and…STRONGFIRST! So simple, so effective, brilliant. Ilaria, can you explain a little more your press sessions? So you roll a die and that way you decide is it going to be heavy day or ladders? and then you roll die again to se how many series, right? Thank you. Thank you! Strongfirst is a certainty! The dice should be thrown only once at the beginning of every session. In the training plan, each number of the dice corresponds to the total number of daily liftings. The heavy day you do it only if you get a number 1 with the dice.